I touched on this in this video, but I wanted to call it out with a separate post. This entry was posted in ICE, ICE Modeling by xsisupport. Bookmark the permalink. You dont have to clone the Mesh to break the cyclic reference. Since the simulation region is not aware of any modelling region activity, you can safely bind to the PointCloud in the simulation region of the Mesh without any risk of cyclic references. 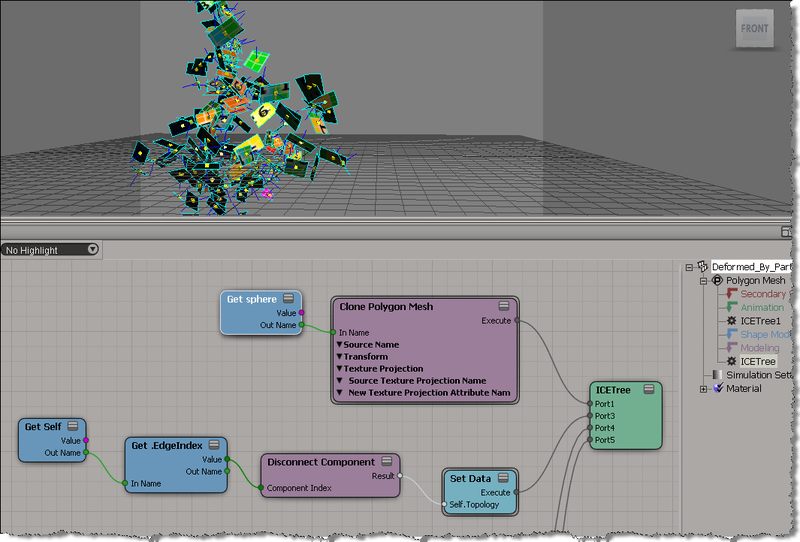 So on the Mesh, you use a modelling region ICE tree to disconnect the components, then use a simulation region ICE tree to bind the Mesh to the PointCloud. Its a much neater setup IMO. Took me a while to figure that out, btw.